It may surprise some of you that we still have a Suncoast in our mall. 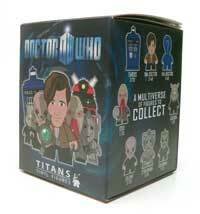 I knew this but was surprised to see a full case of Doctor Who Titans plus 2 boxes there. Without the aid of Mrs. Nerd, I pulled two, and I was rewarded with my first duplicate, an Ood. I had waited until I got home to open them, and after opening the Ood was a bit concerned. So I gave the second box to Mrs. Nerd who opened the Eleventh Doctor. 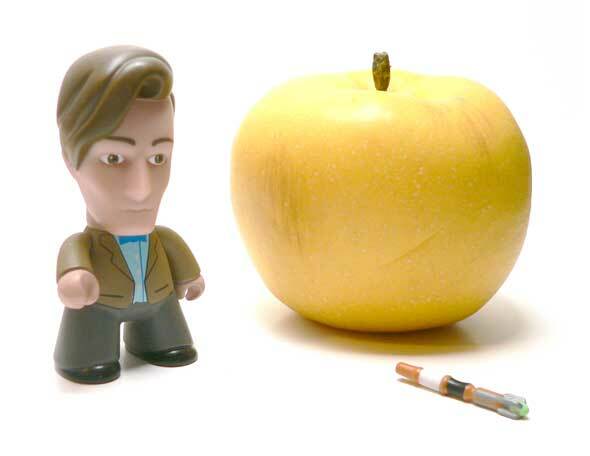 Not only is this the Eleventh Doctor, this is the 1 in 40 variant! “Variant?” you say? Yes, the regular Doctor is 3 in 40 and wearing a tan colored shirt. This one has a blue shirt. I believe this may have been from the first few episodes with Matt Smith. Frankly, from the pics I’ve seen, I like the contrast on this one a bit better. The shirt is light blue with a painted bow tie at the top. Much like the Silence, the lines are very thin. A nice touch is the line work on the shirt is done in dark blue versus the black used for the jacket. There are even 3 buttons here painted in white. The jacket is painted as a typical blazer with a couple of lapels and pockets. The detail that snuck up on me is the patches on the elbows. 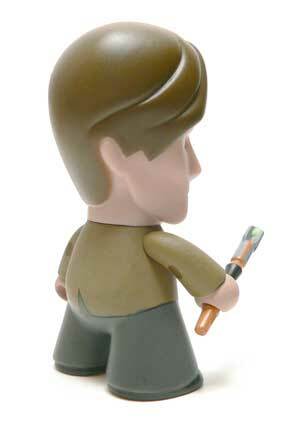 Painted in brown, the add some detail to the back of the figure. 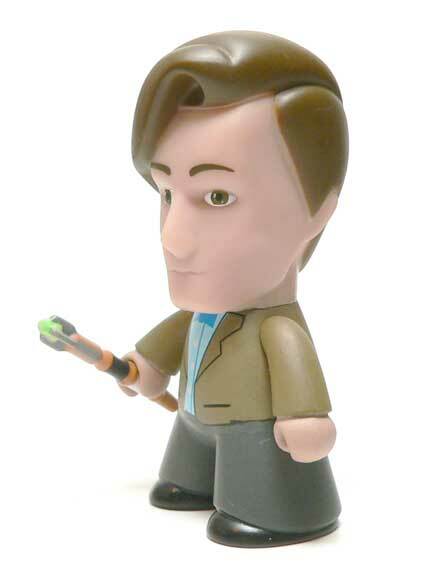 The stylized head manages to pull off Matt Smith’s rectangular face fairly well for this kind of figure. The sunken in cheeks probably do the best job of portraying his thin face. The expression changes to me every time I look at it. Sometimes it looks expressionless, then other angles looks like a faint hint of a smirk. This fits the nature of the Doctor fairly well. Then, of course, we have the hair. Amy Pond calls this Doctor the “Ragedy Man” and I’m guessing it’s because he needs a hair cut. The sculpt on the hair droops down almost to his right eye. It maybe comes down a little too far on the side of his face, but I would contend that is to allow for the elongated head of this design. This figure also comes with an accessory. The Doctor couldn’t save the universe without his trusty Sonic Screwdriver. I have to say this tiny piece is better than I expected. All of the major sections are there and are painted in different colors. For this small of an accessory to have 5 colors is pretty cool. I’m especially impressed with the fact the green goes down between the fingers and not just a dot on the end. Yeah, these are a bit more pricey than say a Lego blind bagged figure. But, I’m really digging the style. The fact that they have made some of my favorite characters probably helps. I’m really glad to have a Doctor on the shelf to keep the peace. The upcoming Tenth Doctor and Angel look pretty tempting. But, part of me wonders if faced with the upcoming 3.75″ action figures and these which choice I would make. Been a while since I have been at the site, but nice. 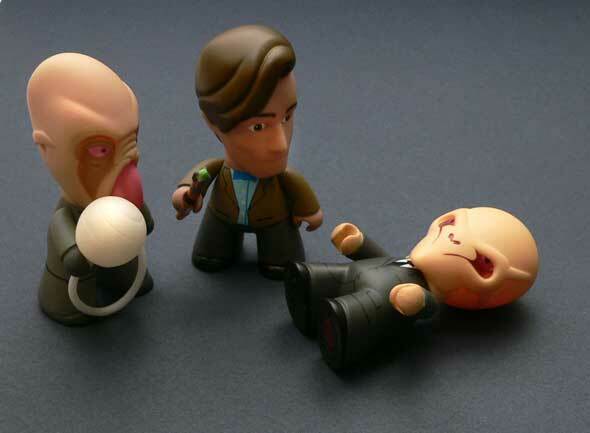 Kinda funny seeing you review Doctor Who Figures given you once said you would pay money to see them not air episodes. Give me a call soon. Lots of happened on my end hopefully just great on your end.